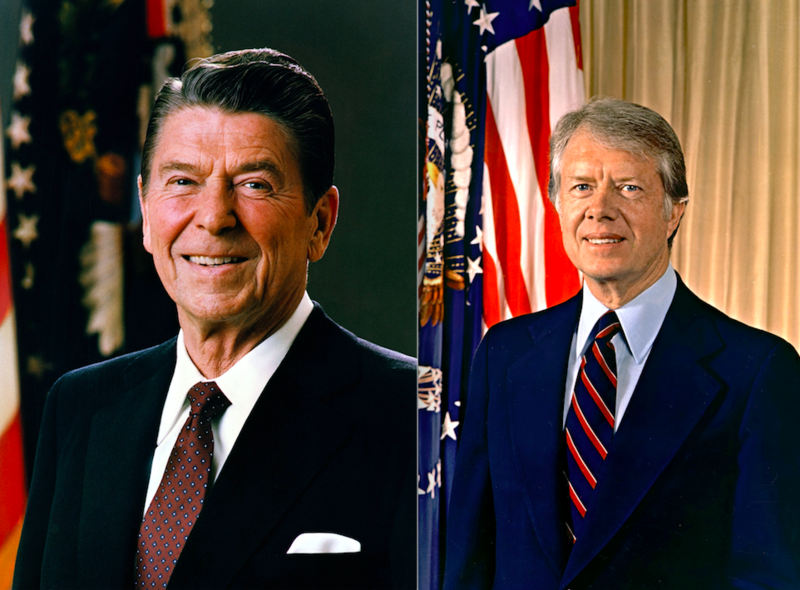 Official Presidential portraits of Ronald Reagan (left) and Jimmy Carter (right). Ohio may be losing its luster as the bellwether state, but, in those days and in the decades to come, it was clear that the road to the White House went straight through the heart of the Buckeye State. I was 27-years-old at the time and working for the Troy Daily News, a little 11,000-circulation newspaper serving Miami County, Ohio, about 75 miles due north of Cincinnati on Interstate 75. I liked a lot of things about the five years I spent living and working in Troy – the people I worked with, my neighbors, the town itself. What I liked most of all was that I worked for a little newspaper that thought like a big one. They let me travel around the country; cover national stories; pick and choose my assignments; and – most importantly – gave me free rein in 1980 to cover the 1980 presidential campaign. And a whole lot of it passed through Ohio. On Thursday, May 29, 1980, it all came together in a piece of downtown Columbus that measured not quite one square mile. 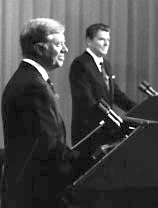 Then-President Jimmy Carter and then-candidate Ronald Reagan debate in Cleveland, October 1980. Jimmy Carter, the incumbent Democratic president of the United States, was there. Ronald Reagan, the former California governor and Hollywood actor who had all but won the GOP presidential nomination, was just a few blocks away. The only one not there was John B. Anderson, the Illinois congressman who was running as an independent that year. He was a liberal in a time when the Republican Party still had such people; he took on the two-party system and ended up with 6.6 percent of the vote. He wasn't in Columbus that day. But I was and so was Troy Daily News photographer Dave Polcyn, my good pal. And Reagan and Carter, of course. It was a smorgasbord of presidential politics and we barely knew where to start. It was a hot and humid day, and Carter and Reagan had dueling rallies nearly simultaneously. It is extremely rare in presidential campaigns that the two major party candidates are campaigning within blocks of each other in the same city, especially that early in the campaign season. Reagan's noon-time rally on the west lawn of the Ohio Statehouse drew a sun-baked crowd of about 5,000, police said. Five blocks north on High Street, Carter was greeted by a crowd of about 10,000 at the Nationwide Plaza. They were so close to each other they could almost hear each other lobbing verbal pot-shots. My fantasy that day was that Carter would march down High Street to the west lawn of the Ohio Statehouse and the two of them could do an old-fashioned Lincoln-Douglas-style debate. A rather silly daydream on my part. I remember doing a lot of running back and forth between the Reagan and Carter events, which wasn't easy, given the security barriers. Fortunately, I had press credentials from both campaigns. There was no such thing as Fitbit in those days. If there had been and I were wearing one, it would have exploded. In addition to the big public rallies, both candidates had private fundraising events in Columbus, and both ended up doing short but appropriately snarky press availabilities, where they spent most of their time running the other down. After rolling into Port Columbus International Airport, Carter spoke briefly with reporters at on the tarmac in front of Air Force One. Carter said when he and Reagan were both governors, he remembered Reagan as the governor "who always came into (national governors' conferences) ill-prepared to discuss the issues, would hold a press conference, get himself on television and then go home." Reagan had a somewhat difference recollection of the governors' conferences. He met with reporters after a $100-a-plate fundraiser at the Neil House hotel, right across the street from the statehouse. The Neil House is long gone, but in those days, it was the social center of Ohio politics. And its famous bar, The Red Lion, was readily accessible to statehouse denizens by walking through the underground parking garage and directly into the basement of the Neil House. Asked about Carter's opinion of his lack of interest in the governors' association, Reagan fired back. "All I can remember is that there was this young governor from Georgia who always showed up, but I'll be darned if I can remember him ever doing anything,'' Reagan said. Reagan said the biggest issue in the fall campaign would be the nation's economy. "What Carter has managed to do in three-and-a-half years is cripple the American economy,'' said Reagan. "The Jimmy Carter dollar has become the J.C. penny." Reagan mused, too, about the candidate for vice president he would have to choose before the Republican National Convention that summer in Detroit. "A great many names will be surveyed in a poll and I will be talking to Republican leaders all over the country before a decision is made,'' Reagan said. "I don't want to try and keep score of how many names are being considered. We have a lot of qualified people in the Republican Party, men and women." In the end, he chose his principal rival for the GOP nomination, George H.W. Bush. This mad dash between one candidate and the other ended up exhausting both me and Polcyn by the time the candidates had moved on. We were more than ready to climb into his car and make the 80-mile trip back to Troy. Carter took Air Force One to Cleveland for a campaign event there; Reagan moved on to Chicago for a late-day event, but was back in Ohio – Cleveland, Akron and Canton – the next day. We worked for an afternoon newspaper, so we didn't have to produce our lead story and photos until the next morning. The rallies in Columbus took place after our Thursday deadline, so I just called in some pre-rally stuff that I wrote off the top of my head. We spent Thursday night working in the office and had everything ready to go for the editors when they came in Friday morning. I was completely exhausted, totally spent, when I stumbled back to my apartment late Thursday night after that incredibly long day. And, as that long day ended, I vowed never again to try to cover two presidential candidates who were within spitting distance of each ever again. Of course, I've broken that vow countless times since then. There should be a law – presidential candidates must stay a minimum of 100 miles away from each other, except for during presidential debates. And, come to think of it, they could Skype those. 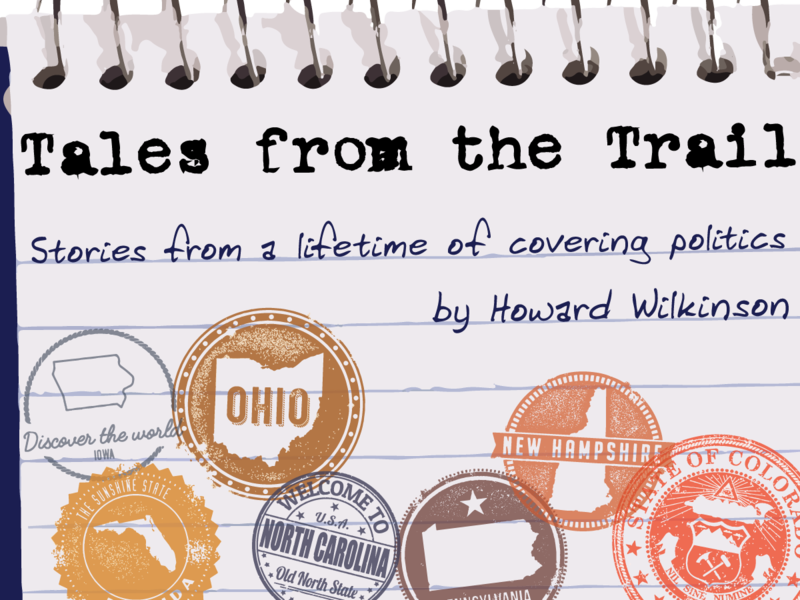 "Tales from the Trail" is Howard Wilkinson's weekly column that gives a behind-the-scenes look at his more than 40 years of covering the campaigns, personalities, scandals, and business of politics on a local, state and national level. Read more here.